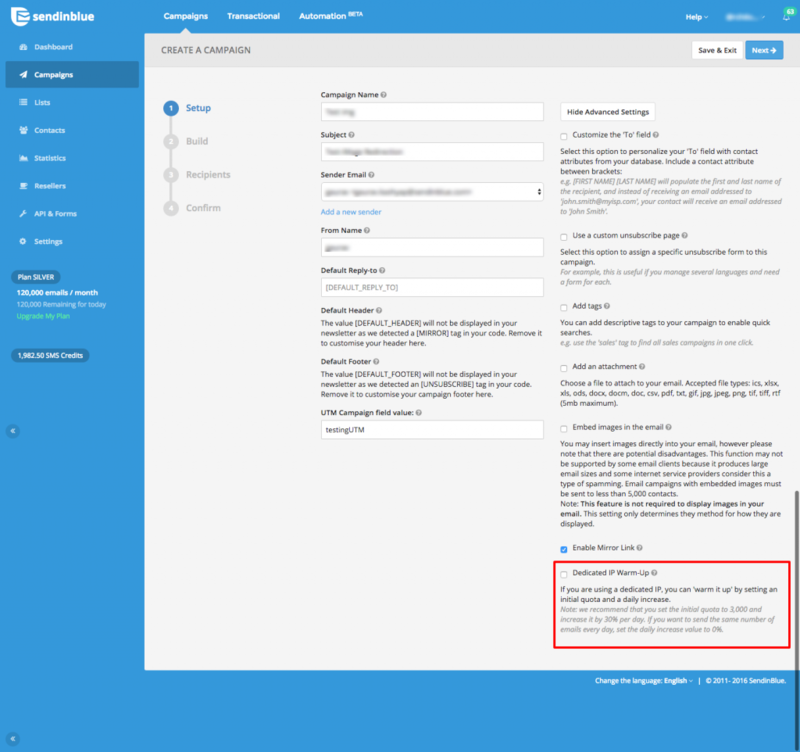 As mentioned previously, a new SendinBlue dedicated IP is "fresh" and its reputation is neutral. Once associated with your domain, your new IP needs to become known by ISPs (like Yahoo, Hotmail, etc.) before it is used to send large volumes of emails. In order to build a positive reputation with ISPs, we highly recommend that you start by sending emails in small amounts and gradually increase these volumes over time. This will allow ISPs to recognize you as a sender and become more lenient with your messages. 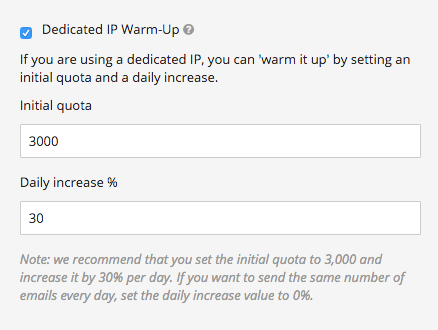 There is an option available in "Advanced Settings" in the first step of creating your campaign to help you warm up your IP. It’s very easy to use: simply enter an initial quota and a daily percentage increase. If you want to send the same number of emails every day, just enter 0 for the daily percentage increase. Please note - this recommendation is an example, and should be adjusted according to your desired daily sending volume. Important: If you do not follow this process to "warm up" your IP (e.g. and instead send 100,000 emails from a fresh IP), ISPs will be surprised by this large sending volume from an unrecognized sender/IP address. When in doubt, ISPs may not deliver your messages to your recipients' inbox. Following the recommended process to gradually increase your sending volumes will enable ISPs to both recognize and trust you as a sender.